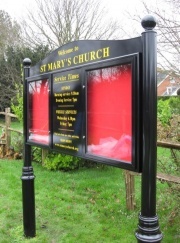 The Premium Range of External Church Notice Boards: Our Premium range of external post mounted Church notice boards are a high quality external display solution. They are manufactured using the highest quality materials and come complete with a durable powder coated gloss finish. Available in a range of 6 styles and 12 size combinations. Featuring a robust 95mm aluminium case profile each notice board comes with a choice or premium loop nylon inserts or powder coated magnetic inserts. With 4mm unbreakable polycarbonate glazing panels each case is supplied with high quality cylinder locks complete with 2 x keys per lock. The posts are supplied as either a traditional cast aluminium ornate post or a more contemporary D post profile. We offer a FREE No Obligation Design Service where we will work with you to design your new Premium Church Notice Board and send you a colour proof for your consideration.